Every pair of newlyweds-to-be want their wedding photos to be unforgettably beautiful and timeless. That goes without saying, and it’s why it’s so important to find the right people for the job. To learn about a few of the ways you can find out if you’re doing that, check out this post, 3 Signs That You’ve Found the Right Wedding Photographers, but beautiful and timeless aren’t the only qualities you’d like to see in your photos. We’ve been in wedding photography in NY and NJ for a long time, so trust us when we tell you that it’s just as important for your pictures to be personal. So, we thought we’d pass on a few tips for ensuring that they are. Let your wedding photographers know about all personal touches. It’s not as if your wedding photography will be the only area of your big day that you’ll want to make more personal. It’s always a good idea to actively look for ways to personalize your wedding throughout every stage of your planning. Whether it’s an addition to your attire, some personal touches you have added to the space’s decor, a cake topper, your party favor, your favorite food which you deliberately have added to your menu, etc., the point is that there will likely be plenty of personal touches in every aspect of your wedding celebration. That’s why it’s so important to speak with your photographers about any and all of the measures you take to make your big day more personal and true to who you and your partner are. Yes, they’ll be well aware of all the big, can’t-miss moments that every couple wants captured, but they may not know of all the specific details you want captured, details that will go along way toward making your photo album more personal. So, make sure you discuss your personal touches with them early on in the process, and to learn about a few of the other things that you need to remember to talk with your photographers about, check out this post, 4 Things You Can’t Forget to Tell Your Wedding Photographers and Videographers. Now, while the personal touches you add to your decor or dress or wherever will absolutely help to make your resulting photos more personal, nothing will help to do that better than you and your partner yourselves. That’s why, while traditional, formal, posed pictures are great, when it comes to making things more personal, candid photos are key. And really, there’s no reason that you can’t get both, especially if you still have plenty of love for the more traditional shots. But it’s the candid additions that will give the people who look at your pictures a feel for who you and your partner and all of your friends and family members who came out to support you on your big day truly are. Whether it’s your or your partner’s reaction to a particularly funny or emotional moment during a speech from one of your guests, a relative having a laugh, an intimate moment shared between you and your partner, etc., those kinds of shots will instantly personalize your album. Now, the thing is that getting those kinds of pictures isn’t always as easy as it sounds, and for some tips, check out this post, How to Get the Candid Wedding Photos You’ve Been Dreaming Of. A big part about getting effective candid photos is simply living in the moment and enjoying yourself on one of the biggest days of your life. Take it from us as veteran NY / NJ wedding photographers, if all you’re thinking about is how you look in your pictures, you won’t likely look that great. But you need to take that same state of mind to any pictures that are taken of you, whether they’re candid or not. Having a good time is essential to getting memorable wedding photos, and more importantly, to getting personal wedding photos. No matter if you, your partner, and your wedding party or family are taking a group shot or it’s just the two of you sharing a more private moment, the point is that you can’t be afraid to let loose and show your true colors. Trust us, whether it’s a shot of the groom and all his groomsmen jumping up in the air or doing some type of fun, improvised pose, you get more elaborate with some costumes or props that speak to your and/or your partner’s personalities, etc., those kinds of pictures will bring an inherent personality to any wedding album. Again, constantly worrying about how you look or how your wedding day is going won’t help, and to learn about how to get yourself to loosen up, check out this post, Tips for Loosening up for Your Wedding Photos. Your wedding photos need to tell your love story. The bottom line is that the most beautiful, timeless, perfectly framed pictures in the world won’t matter much if they’re void of any personality. They’ll just look like every other wedding photo. That’s why it’s so important that you do everything in your power to make your pictures more personal. They need to tell your story. They need to speak to your and your partner’s history and journey together. As you can see, getting photos that do all that isn’t necessarily so easy nor simple. You need to start planning to get pictures like those from the start. We hope these tips get you pointed in the right direction. Good luck! 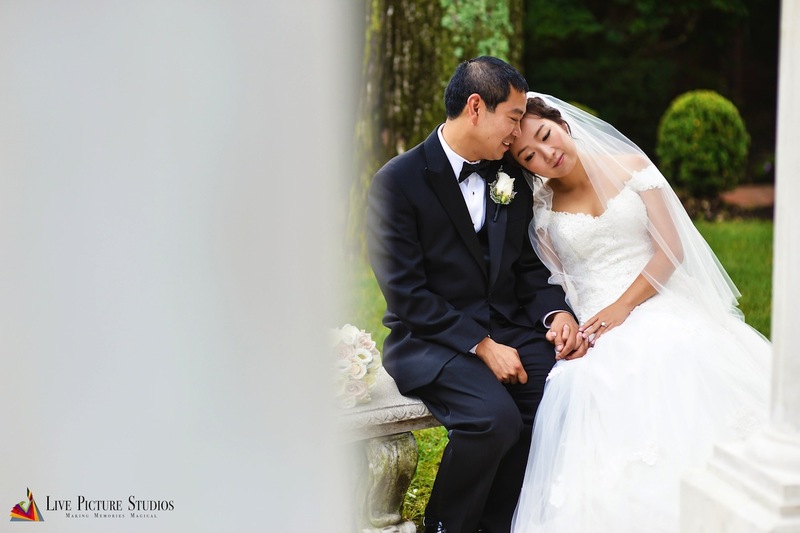 About Us: Live Picture Studios is composed of a team of experienced NY / NJ wedding photographers, videographers, and editors who’ve been making memories magical in the NY, NJ, PA, and CT area with dazzling wedding photos and videos for years. Check out our photo gallery and video gallery for some examples.